Recognizing achievement in advancing the state of the art in fleet optimization, the SHIPPINGInsight Award was presented to Stena Line and NAPA Group during a gala awards luncheon Oct. 1 at the SHIPPINGInsight 2014 Fleet Optimization Conference & Exhibition in Stamford, Connecticut. Presented for the first time, the award honors a ship operating company and its technology partners for the successful implementation of an innovative technology or initiative that reduced operating costs and improved operating efficiencies. An international transport and travel service company based in Gothenburg, Sweden, Stena Line and the Finnish-based NAPA Group were recognized for an energy-saving program, which has achieved yearly savings of more than 17 million euros, based on the comprehensive shore-based monitoring of the eco efficiency of 22 ships. Stena Line uses NAPA software to monitor fuel consumption, speed, departure status and loading data, which is transmitted from ship to shore in real time. The data enables the technical department to assist crews on vessel operation and ultimately improves fuel efficiency, contributing to Stena Line’s goal of reducing fuel volume by 2 percent during 2014. A panel of independent judges, including maritime journalists, academics and third-party experts, selected the winners based on entries submitted. Award recipients received a binnacled captain’s clock in a wooden case. A certificate of merit also went to Matson Line and Emerson Process Management. Now in its third year, SHIPPINGInsight attracts maritime industry executives from around the world with a focus on practical solutions for the challenges facing ship operators. This year’s event was expanded with the addition of a dedicated Marine LNG Symposium, Sept. 30, which preceded the Fleet Optimization Conference & Exhibition, Oct. 1-2. 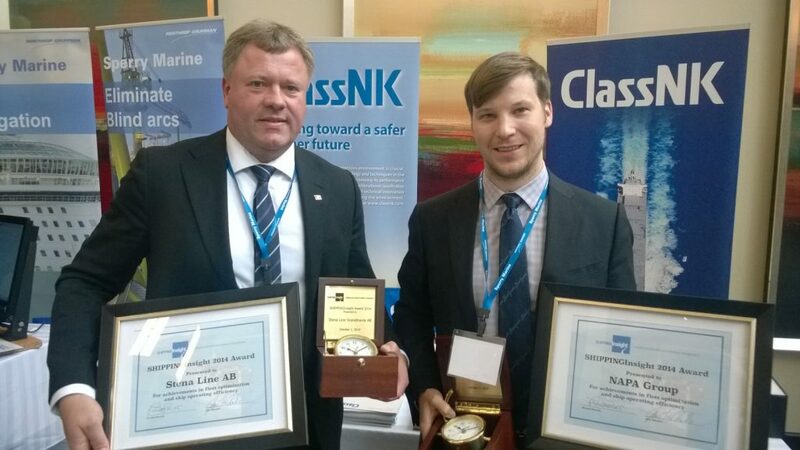 Left to Right: Lars-Erik Hellring, Project Manager, Energy Savings Program, Stena Line, and Jouni Salo, Product Manager, Shipping Solutions, NAPA, winners of the first SHIPPINGInsight Award. Soccoli Associates LLC, a maritime consultancy, and Rhodes Communications, Inc., an international communications firm specializing in the maritime industry, are co-producers for the SHIPPINGInsight Conferences. Maritime Reporter and Engineering News and Maritime Professional magazines are the exclusive media sponsors. For more information, visit www.shippinginsight.com.